Large in every respect – plant, leaves and inflorescences – this stemless cultivar is a riot of colour from early autumn into winter. Up to 7 widely branched inflorescences carry up to 174 short, bright orange racemes – a sight to behold. 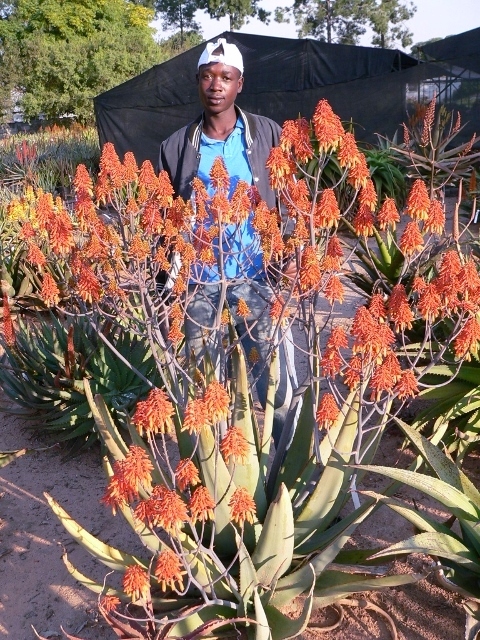 Despite countless efforts this breeder has concluded that there is no hybrid combination that can improve upon the flowering performance of this clone of Aloe elegans. Consequently it is the only pure species honoured with a cultivar name by Sunbird Aloes. It is well worth growing – huge leaves lined with widely spaced red spines emanate at ground level. It seems to prefer a well-drained sandy soil. During wet seasons some of the leaves show blotchiness, but this quickly disappears when the weather dries up again. It has not been tested in a winter rainfall area. When the plant matures it may produce stem shoots at ground level. Up to now, all these shoots have been removed and it is unclear how non-removal of stem shoots will affect the plant except that the clean lines and impressive size of the main plant is likely to be toned down. Although it will do well in a large enough container (at least 50 litres) it almost certainly needs a space in open planting to achieve its best flower production. Work some good quality compost into the soil before planting to make this one of the highlights of the aloe flower season. 16 June 2015. Updated 26 April 2017.